In the Tarot, the suit of Pentacles (often portrayed as Coins) is associated with matters of security, stability and wealth. It's also connected to the element of earth, and subsequently, the direction of North. This suit is where you'll find cards that relate to job security, educational growth, investments, home, money and wealth. 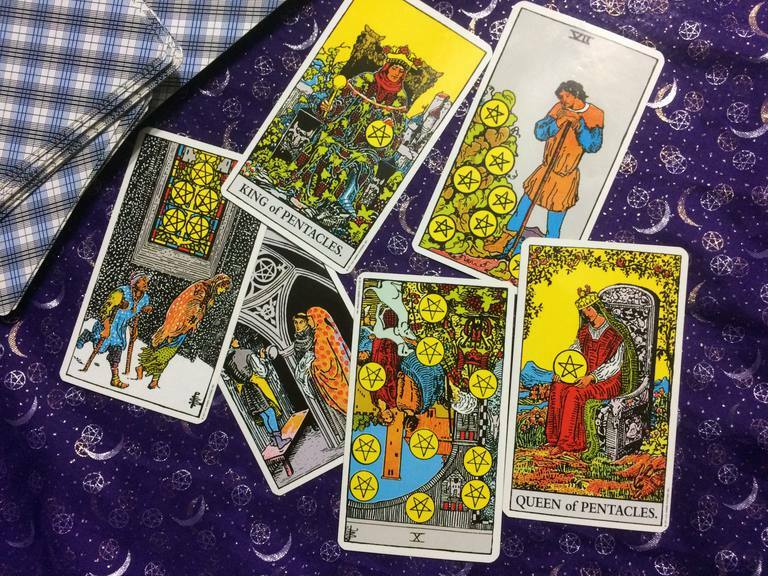 As with the Major Arcana, the Pentacle suit does include meanings if the cards are reversed; however, bear in mind that not all Tarot card readers use reversals in their interpretations. The following is a quick summary of all the cards in the Pentacle/Coin suit. For detailed explanations, as well as images, be sure to click on the link to each card. Ace or One: Prosperity and abundance are on their way. It's time for new beginnings. Reversed: A reversal of fortune in your finances could be coming. Also may indicate a feeling of inner emptiness, and hitting the bottom. Two: You may be juggling funds around - borrowing from Peter to pay Paul, as they say. Don't worry - help is on the way. Reversed: The situation may be out of control, so give yourself a bit of flexibility. Three: It's time to be rewarded for a job well done. A raise or some other accolade may be on its way. Reversed: Delays and quarrels can leave you frustrated. Four: Hard work can lead to thriftiness. You may be toiling hard for your paycheck, but don't be stingy with your hard-earned money. Reversed: You may be cautious or insecure about financial dealings because you've been burned in the past. Try not to let this cloud your judgment. Five: Financial loss or ruin. May also indicate, in some cases, spiritual loss. Reversed: Financial loss has already happened, and may make you feel helpless. Get past it by putting things back together. Six: If you're giving gifts, do so for the joy of giving, not because it will make people like you. Reversed: Unfair treatment relating to some sort of security issue - a lawsuit, hearing, or job matter. Seven: Enjoy the fruits of your own labor - it's good to be rewarded for your efforts! Reversed: You may be saving up for a rainy day, but stop being so stingy towards yourself - treat yourself to something nice once in a while. Eight: You've found a job you enjoy and/or are good at. Use these talents to your own benefit. Reversed: Your skills need some fine-tuning. Practice your talents, and turn them into a successful career asset. Nine: Security, the good life, and abundance surround this card. Reversed: Manipulation and ruthless methods - may indicate that someone is trying to live above their means. Ten: There is money and wealth available to you - don't let opportunities pass by. Reversed: Disharmony is occurring in a home or job that is normally content. Stop the petty quarrelling. Page: Good fortune. This is a messenger card, and often indicates that you'll meet someone who is a student of life. Reversed: News or information about your job or finances is on the way. Knight: Share your good fortune, and use your experiences to help others succeed. Reversed: Step on too many people as you climb the corporate ladder, and you'll find yourself alone at the top, without any friends or supporters. Queen: This is the Earth mother, someone who is easy-going and productive. May indicate abundance of many types, including pregnancy. Reversed: Someone who overcompensates for their unhappiness by chasing financial well-being. King: Indicates a man who is kind and generous. If he offers you financial advice, you'd do well to listen. Reversed: This person is very insecure about his position, and needs constant validation from others. Take our free e-class! Six weeks of lessons delivered right to your inbox will get you started with the basics of Tarot!